The Animal Replacement Centre of Excellence (ARC) is a joint venture between the Blizard Institute at Queen Mary University of London (QMUL) and Animal Free Research UK. It provides a unique environment for scientists to work together with the common goal to develop, validate and apply human-based models of disease. Professor Mike Philpott and Dr Adrian Biddle drive the cutting-edge research. 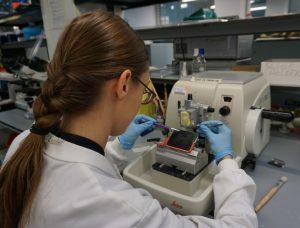 The ARC, funded by a £1 million investment by Animal Free Research UK, aims to maximise and build upon a long-standing successful partnership with the Blizard Institute, a pioneer in the development of in vitro human research models. 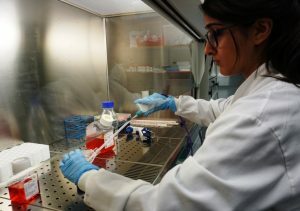 The ARC uses cutting-edge science to advance human models for human disease and aims to reduce the number of animals currently used in cancer research. It also aims to inspire the next generation of scientists through education about animal free research and further funding opportunities. Professor Mike Philpott leads the team of researchers (right, back), which includes Animal Free Research UK funded lecturer Dr. Adrian Biddle (centre), postdoctoral researchers Dr. Gehad Youssef and Dr. Muhammad Rahman (front, right) and two Animal Free Research UK funded summer students, Stephanie Lunt and Shreya Asher (left). Professor Philpott’s research focusses on growing human cells to replicate real human cell tissue. He does this by taking unwanted human skin left over from cosmetic surgery and growing the cells in three dimensions. To investigate skin cancer, these cells can then be manipulated by expressing proteins and genes that cause tumours to develop. Instead of comparing grown human skin cancer models to induced cancer in mice to see if they behave the same way, they are compared to real human cancer skin samples from hospital patients. This cuts out the need for mice completely. [tumour spread] needs to be investigated in a controlled environment where you can look at every step – you can’t do that in an animal. He is therefore developing a more pertinent way to model this process using human cells in a dish, with a goal to identify and target the problem-causing tumour stem cells.  tumour research in mice is achieved by either putting a human tumour into a mouse or changing the genes of the mouse to induce a mouse tumour. Professor Philpot is suspicious that many of these mice models used are not a good representation of cancer in humans. The team at the Animal Replacement Centre are therefore making a big impact by showing that it is possible to replace the use of many thousands of mice through developing lab-grown and more human-relevant tumour models. The team has already successfully made human models of basel cell carcinoma (the most common skin cancer). When they tried to treat their human model with some of the standard drugs currently used on patients, they found that the drugs did not reverse some of the cancer genes that should have been switched back to normal. A lot of patients also do not respond to the treatments, which indicates that there are many other cell changes caused by the cancer that are not being treated by the drugs that have been tested on mice. Therefore it is important to develop these drugs using a human model to ensure that the other pathways involved in the cancer are not missed during development and the best possible treatments can be found. Professor Philpott would like to see the Animal Replacement Centre grow into an international centre of excellence for animal replacement science. The Blizard Institute and QMUL have worldwide reputations for scientific and research excellence, and provide the perfect environment for interdisciplinary collaborative research – a key to success in replacing the use of animals in biomedical research. We at Animal Free Research UK can see how Professor Philpott’s ambition will be achieved with the team’s knowledge, drive and compassion. We look forward to celebrating the success of the team’s research as the success of this initiative could have global implications for the advancement of non-animal medical research.